Please read part one, two, three, four, and five if you haven't already. The next morning was noticeably cooler. Here you can see me standing in front of the summit. The headwall we would be climbing that day is on the right. I had spent a little time doing recreational bouldering at the Metro Rock Gym before going on this trip. It actually helped me with the climbing we did that day. The headwall was steep but not vertical, which made me happy. I am a coward when it comes to sheer faces. Baranco camp stood at the crossroads of two paths up the mountain so we finally met some other hikers, which was a very international group. I talked with a Dane who spoke decent English and gave him some aspirin for his altitude sickness. He was hiking solo and his determination impressed me. I don't think I'd have the guts to try something like that. Mountain climbing takes a certain amount of willpower and, left to my own devices, I would probably give up. It was only after I had been hiking for awhile that I understood the meaning of the phrase, "There's always an excuse." Please permit me a moment to lapse into a little piggish-ness. This portion of the trip was remembered by Tom, Andy, and I as "Booty Shorts Mountain" - so named for the woman wearing the very short shorts hiking in front of us. Try to understand, we had been surrounded by men hiking in the African outback for four days. It was a memorable and welcome change in scenery. Here's Tom and I standing at the top of the headwall. This is one of my favorite photos from the trip. We look so triumphant. 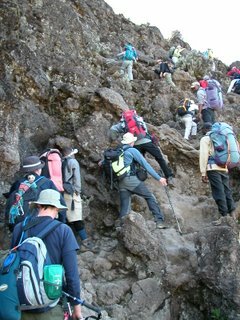 After climbing the headwall, we continued our march to the Karanga Camp which we would be passing through on our way to Barafu, our last campsite before summit day. We stopped briefly in Karanga to eat lunch and refill our water bottles. Andy and Tom agonized over how much water to bring. In the end, they decided they had brought too much. You can see how the trail got very steep on this portion in the background. Those little dots are people hiking. It was a grind but I felt good, no signs of altitude sickness. 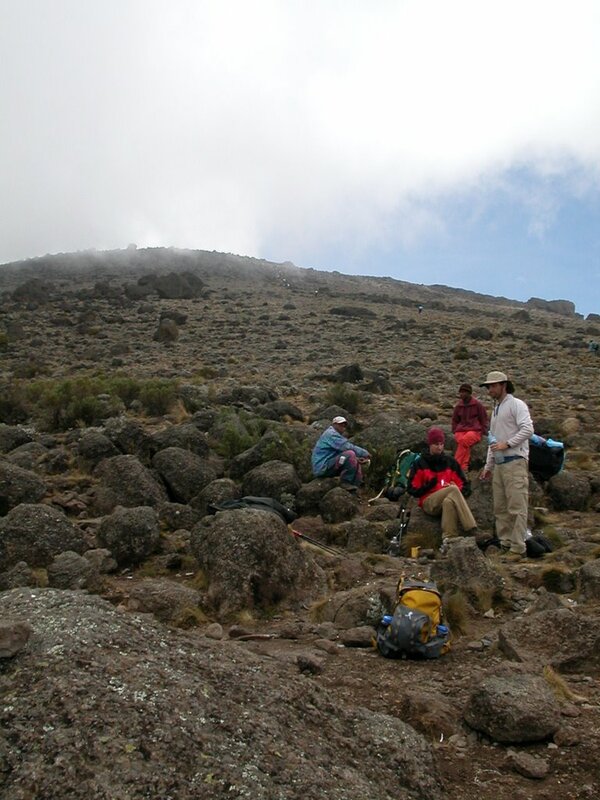 Tom was the only one of us who brought along altitude sickness medication, which he took at this point on the trip. For those of you who don't know Tom, he runs in marathons and sometimes wins them. My brother is a bit of a fitness freak himself. In preparation for this trip, his workouts consisted of loading a backpack with 70 pounds of weight, strapping it to his back, and going on the stair climber for an hour. Once, an acquaintance approached him at the gym and asked, "Andy, what's this about you climbin' rocks?" 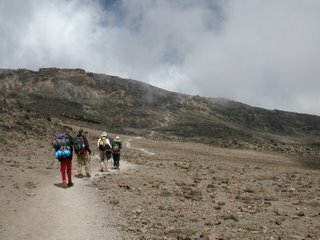 Here's a photo from the final stretch before reaching Barafu. This area was rocky and desolate, almost completely lifeless. I saw one giant hawk or vulture but that was the only sign of life I saw while we were here. The rocks underneath our feet were loose jagged shards. This hike was the first which was fairly draining. When we made it to camp, we collapsed in our tents and slept for a little bit. Tom snapped this picture of the outhouses from the inside of his tent right before he fell asleep. How come it always seems like the best pictures require the least planning and come out when you least expect it. I really liked this photo, just because it makes the viewer feel like they are actually there, seeing something that is real and not a staged event of people posing in front of something. Here's a photo of the porter we nicknamed Dr Seuss. You gotta admire a guy who is unafraid to wear pink striped gators that look like 80's style leg-warmers. I'm glad we got a picture of him. He was the tallest of the crew, probably the thinnest, but he was a working machine. I never saw him slow down. This is one of the only pictures we have of Andy and I in the same frame. If we didn't look so grizzled and worn, I'd have it framed. 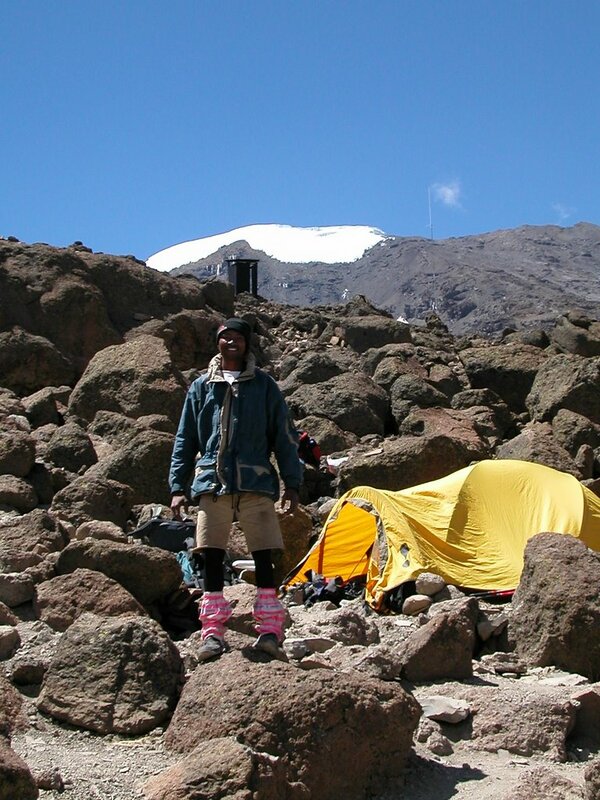 Mawenzi peak is in the background. That evening we ate dinner and tried to calm the butterflies we were all feeling. It's difficult to not feel a little apprehensive when you are standing on the brink of the unknown. Sure we had read some books about the hike but you never know what it is really going to be like. One man's definition of "difficult" can be wildly different from another man's. This miscommunication happened to me when I hiked Mt Rainier, my first over 14,000 foot mountain, in 2004. I was under the impression it was an easy hike, fine for someone in good shape. Volcanoes like Rainier and Kilimanjaro are easier technical climbs than regular mountains. That's the reason I hike them. I asked someone about Mt. Rainier before setting out and they said, "Oh yeah, it's great. You'll love it." This will go down in my personal history as the most inept advice I have ever received. That mountain physically and psychically destroyed me. 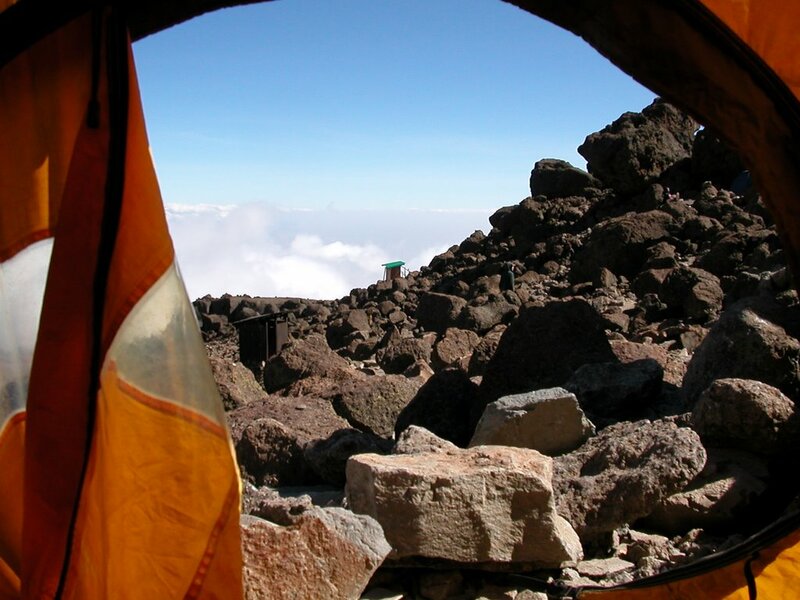 Afterwards, I was grateful to read, "Denali notwithstanding, it [Rainier] is probably the most challenging and physically demanding climb in the U.S."
Standing there on Kilimanjaro at that moment, I feared we were again getting in over our heads. We were on the eve of a lot of work. We would be getting up at midnight, gaining over 4,000 vertical feet and descending 7,000 down. We were about to hike for 15 hours straight. I slept for two hours that night, from 9:30 to 11:30. I spent the last half hour before midnight wide awake and dreading the guide coming to wake us. This was a very vivid memory. It was cold and dark when we got up and set out for the summit. Ey, those vertical walls at Metro ain't so bad. Humbles me on occasion, but being tied to a rope is a bit comforting. What's the next mountain on the checklist? Charmaine - I'm putting some serious thought into climbing Mt Elbrus, but we'll see. It's just so much work climbing these things. Federico - Thank you very much! I wish I could say I was the photographer. My brother and Tom have an eye for these things. When are you going to post the next chapter? Hurry up! I am enjoying reading these!! Great blog... nicely worded. Enjoyed reading every bit of it.